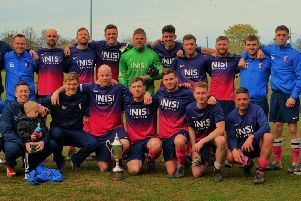 Newbiggin won the Bilclough Cup with an extra-time victory over Embleton at St James’ Park. Embleton were the better team during the early stages but it was Newbiggin who took the the lead through a Bradley Higgins goal after 35 minsutes. Newbiggin were then reduced to ten men but held the lead until half time. After the break Higgins doubled the lead from the penalty spot but Embleton pulled a goal back soon after with a close range effort from Jake Morrison. After this Embleton pushed forward and were rewarded after 88 minutes when a superb strike by Morrison sent the game into extra time. Morrison completed his hat-trick to draw Embleton level again. The winning goal came when Lucas had an effort saved but Jordan Denton was on hand to net the rebound. Harrow secured runner’s up spot in the league following this win. A solid first half performance saw them four goals up at the break and while Wooler did pull a goal back through Brandon Crombie, a fifth goal for Harrow sealed the victory. Goalscorers for the Harrow were Martyn Tait (2), Josh McLeod, Nick Moor and Johnny Simpson. * The two teams will meet again in the final of the Anderson Cup which will be played off at St James’ Park, Alnwick tomorrow (Friday, May 18) with a 7pm kick-off.